As winter draws nigh, many anglers set the rod by the door and call it a season. But some don’t. If you’re the kind of fisherman who keeps an “ice line,” then you already understand the importance of keeping warm. Traditional layering wisdom focuses on the importance of using only synthetic fabric: after all, if you put a pair of cotton long johns on under even the most expensive polypropylene shell, you’re still going to be wearing a sponge by the end of the day. However, thanks to some new (old) technology, we now need to add an important caveat. Not ALL organic fabrics are verboten for layering. 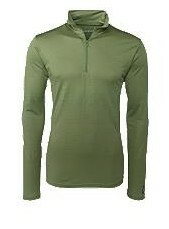 In fact, wool is one of the best baselayer fabrics known to man. The secret lies in the natural protective qualities of the wool fiber, specifically thanks to a compound called lanolin. Lanolin is a natural fatty wax that sheep exude to keep their coats waterproof. As a result, wool fiber–like polypropylene–is highly resistant to water absorption. And that means, if you weave the wool in an appropriate structure, it’ll create some serious wicking effects. That’s where SmartWool picks up. Though best known for their high-end socks, SmartWool actually offers an entire line of wool baselayer products. SmartWool’s Men’s Midweight Zip-T ($70; pictured) (and accompanying Midweight Bottom) are both made of jersey-knit (as in, like a t-shirt) 100% Merino wool. They’re actually machine washable, which is convenient, but thanks to wool’s natural anti-microbial properties, washing them isn’t something you’re forced to do with every wear. Practically, that means you can spend a week in the bush and not come back smelling like Bigfoot. SmartWool has a huge lineup of baselayer and midlayer products (especially compared with most fly fishing companies, which obviously tend to focus on other things). With Christmas coming, whether your list includes socks and stocking caps or high-end apparel, SmartWool is worth checking out. Let us know your thoughts on wool baselayers in the Comments section!